At the press conference during E3 event, Microsoft company has presented the first Call of Duty: Advanced Warfare gameplay video. Earlier we have already seen some footage of the upcoming project, but this time the developers have pleased the fans with the whole 9-minute long trailer. As the latest Call of Duty: Advanced Warfare gameplay video shows, the shooter is set in July 2054. The US marines team appears in the epicenter of the destructive combatant - the war-torn South Korean city, supposedly Seoul. But the main emphasis of this Call of Duty: Advanced Warfare gameplay video is on the hi-tech gadgets and weapons, which the soldiers own. Thus, for example, the assault rifle of the main character - Mitchell - is equipped with the holographic display. It shows the remaining ammo amount. 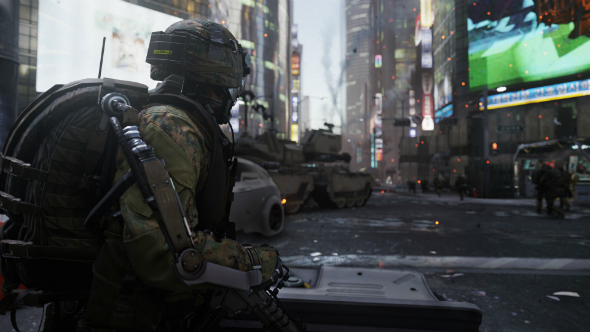 Besides that, in the new Call of Duty: Advanced Warfare gameplay video, you may see the exo suit, about which we told you in the previous article, in action. With its help Mitchell can easily jump from one object to another. In the new part of the popular shooter series the grenades will also be upgraded. Now they have several detonation modes. Moreover, the players will be able to choose various ways of shooting from the one weapon. As the trailer above demonstrates, if you pre-order Call of Duty: Advanced Warfare, you will receive the Advanced Arsenal Pack. It consists of Bullet-Brass exoskeleton and the new type of weapon - EM1 Quantum, - which shoots with energy waves and doesn’t require any ammo. Let us remind you that the upcoming project is to be launched on November 4th, 2014 for PC, current and next-gen consoles. So, what are your impressions from the gameplay? Did you like it? Are you going to pre-order Call of Duty: Advanced Warfare? We’ll be glad to see your answers in the comments below.